Provides firm support & compression for strains and sprains. Retains elasticity after repeated use and washing. Clips enable bandage is secured. Helps keep clothing free of dust, dirt and grime; breathable back panel helps improve air ventilation helping to keep you cooler; two-way zipper makes getting in and out of the coveralls easier while helping prevent contaminants from getting in; elastic waist helps control excessive material; one size that fits most; good for both the professional and the DIYer. Used for traffic safety and control, construction sites, hazard marking and a variety of other applications; high visibility; day-glow orange color; durable construction for use in various weather conditions; white liner and rugged base. The "Revolution Series" is a line of innovative, high quality, cost effective products featuring the Circle Interlocking System and Leveling Differential Mechanism, delivering outstanding performance under the harshest conditions. Triangular day-glo vinyl traffic safety cone; flexible, yet durable; bright fluorescent orange color for high visibility. Used for traffic safety and control, construction sites, hazard marking and a variety of other applications; high visibility; day-glow orange color; durable construction for use in various weather conditions; white liner and rugged base. Soft touch fabric contours to the body and remains flexible when cold. Convenient and ready to apply to skin without a cover or wrap. Helps relieve pain and swelling fast. Ideal for relieving inflammation and joint pain and increasing circulation. The "Revolution Series" is a line of innovative, high quality, cost effective products featuring the Circle Interlocking System and Leveling Differential Mechanism, delivering outstanding performance under the harshest conditions. A hooded, disposable safety work garment that provides particle protection against mold, lead and dust; gives protection from insulation dust/fibers allergens, dust and debris; includes renovations, insulation, paint spray/splash and repair; elasticized waist, ankles for convenience and freedom of movement with knit cuffs for increased comfort. Kit contains: (30) 1? x 3? adhesive plastic bandages, (2) knuckle fabric bandages, (2) fabric fingertip bandages, (1) 3? conforming gauze roll bandage, (1) 40? triangular sling/bandages with two safety pins, (8) 3? x 3? gauze dressing pads, (1) 5? x 9? trauma pad, (30) antiseptic cleansing wipes,(6) First Aid/burn cream packs (.9gms), (6) antibiotic ointment packs, (1) 1/2? x 10 yd. tape roll, (1) pair nickel plated scissors (4? ), 4? plastic tweezers (one time use), 2 pairs exam quality gloves and 1 First Aid Guide. Plastic Case with gasket, 9-1/6? x 6? x 2-3/8?. Kits have bilingual (English/Spanish) labels. 25 Person Kit. Triangular day-glo vinyl traffic safety cone; flexible, yet durable; bright fluorescent orange color for high visibility. The "Revolution Series" is a line of innovative, high quality, cost effective products featuring the Circle Interlocking System and Leveling Differential Mechanism, delivering outstanding performance under the harshest conditions. Perfect for use in the home, auto, sports. Ample room for personal medications. Be ready for all potential emergencies at home, in the car, outdoors or on the water. Supplies are easy to find in our newly designed organizer case. Kit Includes: (50) 3/4" x 3" Adhesive plastic bandages; (10) 1" x 3" Adhesive plastic bandages; (1) Knuckle fabric bandage; (1) Fingertip fabric bandage; (2) 2" x 4" Elbow & knee plastic bandages; (2) 1-1/2" x 1-1/2" Patch plastic bandages; (5) 3/8" x 1-1/2" Junior plastic bandages; (2) Butterfly wound closures; (8) 2" x 2" Gauze dressing pads; (2) 3" x 3" Gauze dressing pads; (1) 5" x 9" Trauma pad; (2) Aspirin tablets; (2) Ibuprofen tablets; (2) Extra-strength non-aspirin tablets; (10) Alcohol cleansing pads; (9) Antiseptic cleansing wipes (sting free); (2) Antibiotic ointment packs; (1) 1/2" x 5 yd First aid tape roll; (1) 4" x 5" Instant cold compress; (1) Sterile eye pad; (1) 6" x 11/16" Finger splint; (10) 3" Cotton tipped applicators; (1) Medium #2 safety pin; (2) Exam quality vinyl gloves; (1) 4" Tweezers, plastic (1) 40 pg. First aid guide; Kit Dimensions: 9-3/8" x 8-7/8" x 2-3/4". Used for traffic safety and control, construction sites, hazard marking and a variety of other applications; high visibility; day-glow orange color; durable construction for use in various weather conditions; white liner and rugged base. The "Revolution Series" is a line of innovative, high quality, cost effective products featuring the Circle Interlocking System and Leveling Differential Mechanism, delivering outstanding performance under the harshest conditions. 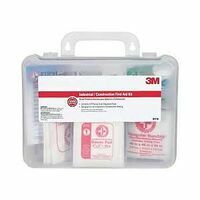 3M First Aid Kit, 118 PC Packing, 11 in Width, 5-1/2 in Length, 9-1/2 in Height, Plastic, Includes: (15) Adhesive Bandages -3/8 X 1-1/2 in, (30) Adhesive Bandages - 1 X 3 in, (1) Triangular Bandage - 40 X 40 X 56 in, (1) Adhesive Tape - 1/2 in X 5 yd, (10) Cotton Tip Applicators, (2) Finger Splints, (4) Gauze Pad - 2 X 2 in, (1) Scissors The "Revolution Series" is a line of innovative, high quality, cost effective products featuring the Circle Interlocking System and Leveling Differential Mechanism, delivering outstanding performance under the harshest conditions. Be ready for all potential emergencies at home, in the car, outdoors or on the water. This new generation of hard kit is developed to save time and frustration in the midst of emergency situations. Supplies are easy to find in the newly designed organizer case. Kit contains: (50) 3/4"x3" Adhesive plastic bandages; (10) 3/4"x3" Fabric bandages; (20) 1"x3" Plastic bandages; (8) Knuckle fabric bandages; (8) Fingertip fabric bandages; (1) 2"x4" Elbow & knee plastic bandage; (20) 3/8"x1-1/2" Junior plastic bandages; (5) Butterfly wound closures; (12) 7/8" Spot plastic bandages; (10) 2"x2" Gauze dressing pads; (2) 3"x3" Gauze dressing pads; (1) 5"x9" Trauma pad; (2) Aspirin tablets; (2) Ibuprofen tablets; (4) Extra strength non aspirin tablets; (8) Alcohol cleansing pads; (12) Antiseptic cleansing wipes (sting free); (4) Antibiotic ointment packs; (1) 1/2"x5 yd. First aid tape roll; (1) 4"x5" Instant cold compress; (1) Burn relief pack, 3.5 gm. ; (1) Sterile eye pad; (1) Emergency blanket; (10) 3" Cotton tipped applicators; (1) 6"x11/16" Finger splint; (2) Exam quality vinyl gloves; (1) 4" Tweezers, plastic; (1) 40 pg. First aid guide; Kit Dimensions: 9-3/8"x8-7/8"x2-3/4"
Be ready for all potential emergencies when on the road. Our new generation of hard kit is developed to save time and frustration in the midst of emergency situations. Kit includes: (30) 3/4"x3" Adhesive plastic bandages; (20) 3/4"x3" Fabric bandages; (2) Knuckle fabric bandages; (2) Fingertip fabric bandages; (1) 1-1/2"x1-1/2" Patch plastic bandage; (10) 3/8"x1-1/2" Junior plastic bandages; (3) Butterfly wound closures; (6) 2"x2" Gauze dressing pads; (2) 3"x3" Gauze dressing pads; (1) 5"x9" Trauma pad; (1) 2" Conforming gauze roll bandage; (4) Ibuprofen tablets; (4) Extra-strength non-aspirin tablets; (2) Motion sickness tablets; (10) Alcohol cleansing pads; (12) Antiseptic cleansing wipes (sting free); (2) Insect sting relief pads; (3) First aid /burn cream packs; (1) 1/2"x5 yd. First aid tape roll; (1) 4"x5" Instant cold compress; (1) 6"x11/16" Finger splint; (10) 3" Cotton tipped applicators; (2) Medium #2 safety pins; (1) Emergency blanket; (1) Light stick; (1) Call 911 banner; (1) Accident report form; (2) Exam quality vinyl gloves; (1) 40 pg. First aid guide; Kit Dimensions: 9"x8-1/2"x2-5/8". Kit contains: (100) 1" x 3" adhesive plastic bandages, (2) knuckle fabric bandages, (2) fabric fingertip bandages, (1) 3" conforming gauze roll bandage, (1) 40" triangular sling/bandages with two safety pins, (8) 3" x 3" gauze dressing pads, (1) 5" x 9" trauma pad, (42) antiseptic cleansing wipes,(6) First Aid/burn cream packs (.9gms), (6) antibiotic cream packs, (1) 4" x 5" instant cold compress, (1) 1/2" x 10 yd. tape roll, (1) pair nickel plated scissors (4"), 4" plastic tweezers (one time use), 2 pair exam quality gloves and 1 First Aid Guide. Plastic Case with gasket, 9-1/6" x 6" x 2-3/8". Kits have bilingual (English/Spanish) labels. 25 Person Kit. Triangular day-glo vinyl traffic safety cone; flexible, yet durable; bright fluorescent orange color for high visibility. Kit contains: 1 bx of (16) 3/4" plastic adhesive bandages; (6) B2K antiseptic towelettes; (1) 1-3/4" x 2" fingertip fabric bandages, (1) 2" x 4" knee/elbow plastic bandage, (1) 36" x 36" x 51" triangular sling/bandage with 2 safety pins, (4) 2" x 2" gauze dressing pads (2-2 packs), (2) 4" x 4" (1 -2pk) gauze dressing pads, (4) 3" x 3" (2-2pks) gauze dressing pads, (1) each of 2" x 4.1 yd. & 3" x 4.1 yd. gauze roll bandages, (1) 5" x 9" trauma pad,(1) sterile eye pad, (6) alcohol cleansing pads, (3) triple antibiotic ointment packs, (1) burn relief pack (3.5 gm) (1) 6" x 9" instant cold compress, (6) aspirin tablets (3 -2-pks), (1) roll of 1" x 5 yd. tape. (1) pair of nickel plated scissors (4-1/2"), 4" tweezers, (1) pair of vinyl gloves, (1) First Aid Guide book. Plastic Case with gasket is 7-11/16" x 4- 9/16" x 2-3/8". 10 Person Kit. The "Revolution Series" is a line of innovative, high quality, cost effective products featuring the Circle Interlocking System and Leveling Differential Mechanism, delivering outstanding performance under the harshest conditions. Included in the kit is a first aid manual, major wound bandage and instant cold pack in a Unique, stylish, attractive translucent carrying case with dispenser tray that helps keep contents organized. The kit's sliding lock allows it to be hung from hooks. Kit contains: (15) Adhesive Bandages 3/8" x 1-1/2", 30 Adhesive Bandages 1"x 3", (2) Sterile Sponge Dressings, 2" x 2" (2 in one pack), (4) Sterile Sponge Dressings, 4" x 4" (2 in one pack), (1) Sterile Trauma Pad 5"x 9" , (27) Alcohol Prep Pads, (27) Antiseptic Towelettes, (2 ) Providone Iodine Pads, (2) Sting Relief Pads (for insect bites), (1) Adhesive Tape Roll, 1" x 5 yards, (4) Finger Splints, (2) Antibacterial Treatment, (6) Burn Cream .9 grams, (1) Instant Chemical Cold Pack, (4) Protective Natural Barrier Gloves, (1) Tweezers, 4", (10) Cotton Tip Applicators, (1) Scissors,(1) Gauze Roll (3" x 2.5 meters), (1) Eye Pad, (4) Non-Aspirin Tablets, (2) Antacid Tablets, (2) Ibuprofen Tablets, (1) Triangular Bandage, (1) Eye Wash, 1 oz., and (5) Safety Pins. Kit Contains: (50) Adhesive plastic bandages, 3/4" x 3"; (3) Large fingertip fabric bandages; (2) Knuckle fabric bandages; (1) Triangular sling/bandage, w/2 safety pins, 36"; (6) Gauze dressing pads, 2" x 2"; (1) Conforming gauze roll bandage, 2"; (1) Trauma pad, 5" x 9"; (1) Sterile eye pad; (12) BZK antiseptic towelettes; (6) Triple antibiotic ointment packs; (3) Insect sting relief pads; (1) Eye wash, 4 oz. ; (1) Instant cold compress, 4" x 5"; (12) Aspirin tablets, (6) 2-pks; (1) First aid tape roll, 1/2" c 5 yd. ; (1) Scissors, 4-1/2", nickel plated; (1) Tweezers, 4", plastic; (2) Exam quality, vinyl gloves, 1 pair; (1) First aid guide. Kit contains: (100) 1" x 3" adhesive plastic bandages, (2) knuckle fabric bandages, (2) large fabric fingertip bandages, (1) 3" conforming gauze roll bandage, (1) 40" triangular sling/bandages with two safety pins, (8) 3" x 3" gauze dressing pads, (1) 5" x 9" trauma pad, (42) antiseptic cleansing wipes, (6) First Aid/burn cream packs (.9gms), (6) antibiotic ointment packs, (1) 4" x 5" instant cold compress, (1) 1/2" x 10 yd. tape roll, (1) pair nickel plated scissors (4"), 4" plastic tweezers (one time use), 2 pair gloves and 1 First Aid Guide. Metal Case with gasket, 10-1/2" x 7" x 2-1/2". Kits have bilingual (English/Spanish) labels. 25 Person Kit - Metal Case. Kit Contains: (125) 1? x 3? adhesive plastic bandages, (5) knuckle fabric bandages, (5) fabric fingertip bandages, (2) 3? conforming gauze roll, bandage, (2) 40? triangular sling/bandages with two safety pins, (12) 3? x 3? gauze dressing pads, (2) 5? x 9? trauma pad, (60) antiseptic cleansing wipes,(6) First Aid/burn cream packs (.9gms each), (6) Antibiotic ointment packs, (2) 4? x 5? instant cold compress, (1 Bx) 1/2? x 10 yd. First Aid tape roll, 2/bx,(1) pair nickel plated scissors (4? ), 4? plastic tweezers (one time use), 2 pairs gloves and 1 First Aid Guide. Plastic Case with gasket: 9? x 9-3/16? x 2-3/4?. Kits have bilingual (English/Spanish) labels. Designed for fleet and commercial vehicles. Its hard metal case with gasket holds quality brand products that are easily accessible in an emergency. This kit meets federal OSHA recommendations and offers easy refilling with the help of a full color reordering schematic. Refills are color coded for ease of identification. Kit contains: (1) A-100: 3/4"x3" Adhesive plastic bandages, 25/bx; (1) A-102: 5 Knuckle, 5 large fingertip fabric bandages; (6) 3"x3" Gauze dressing pads, (3) 2-pks; (1) 2" Conforming gauze roll bandage; (1) 36" Triangular sling/bandage, w/2 safety pins; (10) Ibuprofen tablets, (5) 2-pks; (1) B-304: Antiseptic cleansing wipes (sting free), 18/bx; (4) Triple antibiotic ointment packs; (1) AN-404: Burn relief packs, 6/bx; (1) 1/2"x10 yd. First aid tape roll; (1) B-503: 4"x5" Instant cold compress, 1/bx; (2) Sterile eye pads; (1) Eye wash, 4 oz. ; (1) AN-5112: Exam quality vinyl gloves, 2 pr/bx; (1) 4" Scissors, nickel plated; (1) 4"Tweezers, plastic; (1) First aid guide: Kit Dimensions: 6-5/16x9-1/16"x2-3/8". Kit contains: 1 bx (100) 3/4" x 3" adhesive plastic bandages, (1) 1/2" x 10 yd First Aid tape roll, 1 bx (1) 36" x 36" x 51" triangular sling/bandage with 2 safety pins, (1) 2" x 5 yd. latex free elastic bandage, (2) 2" x 4.1 yd gauze roll bandages, (1) 3" x 4.1 yd. gauze bandage, 2 bxs (12) 2" x 2" gauze dressing pads (3 2-pks/bx), 2 bxs (4) sterile eye pads, 1 bx of (18) antiseptic wipes, (1) bx of 10 triple antibiotic ointment packs, 1 bx of (10) insect sting relief pads, (1) 4 oz. eye wash, 1 bx CPR pack with: 1 rescue breather, CPR one way valve face shield, (2) large latex gloves, and (3) antiseptic cleansing wipes. 1 bx 4" x 5" instant cold compress, 1 bx (20) aspirin tablets (10-2pks), 1 pair nickel plated scissors (4-1/2"), 1 plastic 4" tweezers, (2) pair gloves, (1) BX 5" x 9" Trauma pad and 1 First Aid Guide. Plastic Case is 10-3/4" x 11-1/4" x 3". 50 Person Kit. This general business kit is ideal for businesses, offices, and work sites. Metal cabinet has swing out door and easy to carry handle. Cabinet design eliminates disorganized and missing supplies. Clearly labeled compartments. Kit includes: (25) 1? x 3? fabric bandage, (5) knuckle fabric bandage, (5) fingertip fabric bandage, (25) 3/4? x 3? plastic bandage, (1) 40? triangular sling/bandage, (1) 2? gauze roll bandage, (1) 3? gauze roll bandage, (1) 1/2? x 10yd first aid tape, (10) 3? x 3? gauze dressing pads, (1) 5? x 9? trauma pad, (10) antiseptic cleansing wipe (sting free), (10) antibiotic ointment, (10) first aid/burn cream, (1) 3? stainless steel tweezers, slanted, (1) first aid guide, (2 pairs) exam quality vinyl gloves, (1) scissors. OSHA compliance. Triangular day-glo vinyl traffic safety cone; flexible, yet durable; bright fluorescent orange color for high visibility. Ideal for businesses, offices, and work sites; plastic cabinet has swing out door and easy to carry handle. Cabinet design eliminates disorganized and missing supplies. Clearly labeled compartments create a cabinet that is easy to use and restock. Kit includes: (1) trauma pad, 5? x 9?, (1) gauze dressing pad, 3? x 3?, 10 pads, 2/pk, (1) gauze dressing pad, 2? x 2?, 10 pads, 2/pk, (1) scissors, (1) stainless steel tweezers, 3?, (1) patch plastic bandages, 1-1/2? x 1-1/2?, 10/bx, (1) plastic bandages, 3/4? x 3?, 25/bx, (1) fabric bandages, 1? x 3?, 25/bx, (1) fingertip fabric bandages, 10/bx, (1) knuckle fabric bandages, 10/bx, (1) alcohol cleansing pads, 20/bx, (2) antiseptic cleansing wipes (sting free), 10/bx, (1) conforming gauze roll, 2?, (1) conforming gauze roll, 3?, (1) butterfly wound closures, 10/bx, (1) first aid tape, 1/2? x 10yd, (1) triangular sling/bandage, 40? x 40? x 56?, (1) cpr face shield and vinyl gloves, 1 shield and 1 pr of gloves, (1) exam quality vinyl gloves, 2 pairs, (1) first aid/burn cream, 10/bx, (1) antibiotic ointment, 10/bx, (1) extra-strength non-aspirin tablets, 20/bx, 2/pk, (1) ibuprofen tablets, 20/bx, 2/pk, (1) aspirin tablets, 20/bx, 2/pk, (1) first aid guide. OSHA compliance.